Like most of us, I have these little dream goals that putter along in the back of my mind... Ok, well, I suppose sometimes I dream BIG. Anyway, some of these dreams are realized, others not. Some are realized in installments, and sometimes the fulfillments sneak up on me. For example, back at the beginning of my professional career as a recording engineer, over twenty-five years ago, I began to dream of installing a custom stereo system in my home. I wanted a system with speaker components that had a recording pedigree and offered the range and smooth response of large studio monitors. At the same time, this system would be shared by my wife, who, though a very smart cookie and reasonably technically-oriented, has no interest in dealing with a complicated system with lots of little knobbies to tweak and switches to throw. The system would be used in my living room, so the gear would need to be “to-scale” and homey. I also knew I would never have a lot of money to throw at the project, which pretty much permanently relegated the whole project to dreamland, as far as I could tell. I suppose the whole deal began back in the early eighties. After growing up in a Tennessee town and going to college, I began working full-time as a recording engineer for a large company in 1981. 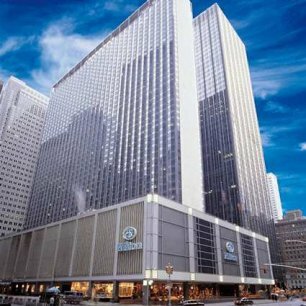 I attended my first Audio Engineering Society meeting at the Hilton Convention Center, on the Avenue of the Americas in New York, in 1983. Imagine! Travelling to my first trade show… and in New York! Meeting console designer Rupert Neve! Rubbing elbows with the giants of the industry and getting my hands and ears on some of the newest and best equipment of my trade! To put it mildy, the experience put stars in my eyes. The eighties represented the apex of the independent recording studio movement. Analog audio equipment manufacturing was at its zenith. Posh studio facilities vied for the business of the artists and labels. After an industry slump at the end of the '70s, excitement, optimism, and growth were everywhere. Because my company was in the process of designing some new facilities, they flew up six engineers to the show, including me. At the show we were courted and entertained by British manufacturers Neve and Solid State Logic, the two most respected console manufacturers in the industry. One of the most exciting products at this show was the UREI range of monitors with its distinctive blue horns. At that time, Bill Putnam's United Recording Electronics Industries (UREI) was beginning to take the recording world by storm with their UREI 813 Time-Aligned monitors. UREIs were everywhere in the trade magazines. The clickable image to the right is from the back cover of Mix Magazine, October 1981. That ad is on the first issue I received with my professional subscription to MIX. 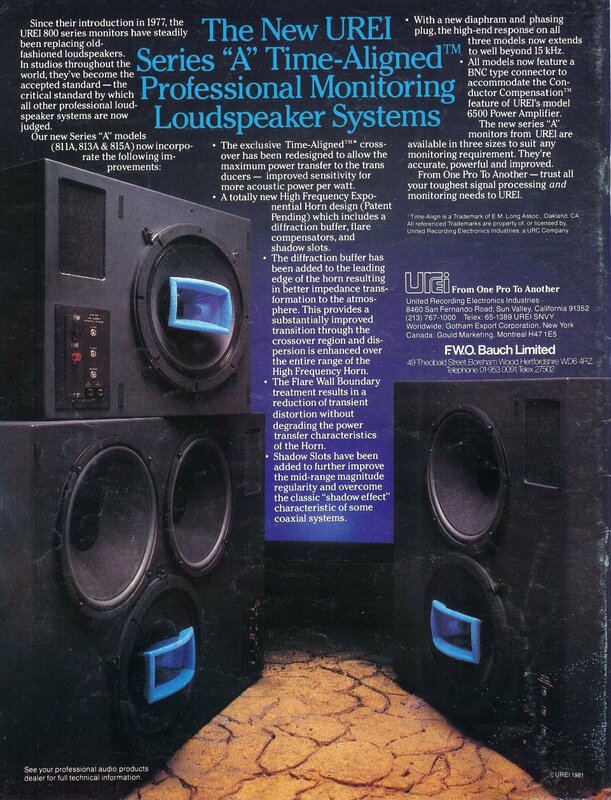 By my next AES meeting in 1985, JBL Corporation had purchased UREI and refined their range of monitors to create the "C" series, featuring all-JBL components and 15" drivers with bright metal rims. Click HERE to see the components from an 813c. By then the trademark blue UREI tweeter horns and cast rims were ubiquitous at the shows, making appearances in booths on the show floor and in the suites rented by manufacturers to show off their goods. I remember being entertained in the JBL suite where the manufacturer’s reps set up easy chairs and a pair of UREIs and played Andreas Vollenweider’s latest album, White Winds, to demonstrate the UREIs. Let me tell you, they sounded fabulous! The upper-end was clear, sharp, and smooth, and the imaging was spectacular - inviting you to point out the location of any particular sound in the sound field. The midrange was smooth and comfortable without peaks that would fatigue the ears. While the rep was busy, I checked out the signal chain – there was nothing there except a CD player and a power amp – no EQ or tone controls! Incredible. 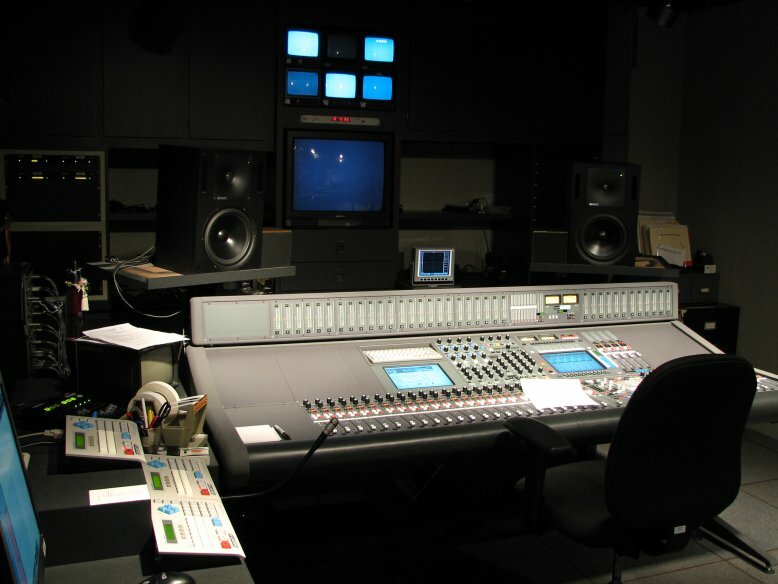 Using information gleaned from the trade shows, my company put together the equipment and design for what was to become our premier audio suite, with a control room designed on Live-End Dead-End principles. For monitors, we chose UREI 813c’s, featuring a concentric 15” woofer/tweeter with a “helper” 15” woofer added to increase bass and power handling capability. You can see a picture of our installation wih the dress cover removed to the left. Click for a larger view. 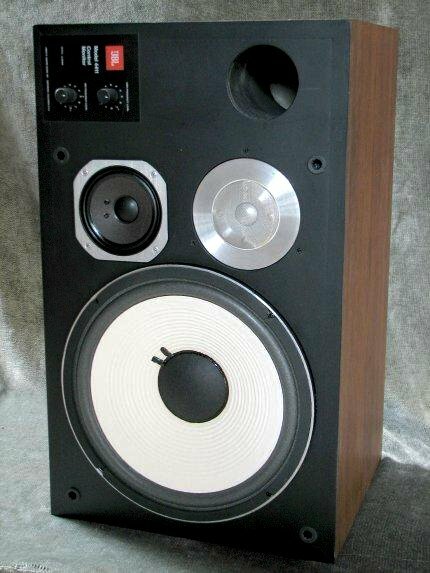 These are very early "C" models, before JBL added the bright metal rim. After our success with the 813c's, we ordered a pair of the 811c’s for a second control room. Other than deleting the helper woofer and having a smaller cabinet, these were very comparable to the 813c’s, sharing the same main coaxial, time-aligned driver. We installed the 811c's in a control room with limited volume capacity: If the monitors had been cranked, they would have interfered with another room next door. As a result, this pair was run pretty quietly for its entire duty life. At delivery time, the 813c’s cost $5200 and the 811c’s cost $3800. These monitor systems have been at the core of my operations for nearly twenty years now. They’ve got the smoothest, least peaky midrange and cause the lowest ear fatigue of any monitor I’ve ever used, before or since. In 2006, the 813's were inducted into the AES technology Hall of Fame. As popular control room design progressed from stereo into surround, I kept a weather eye on the trade magazines to watch the trends. Several top facilities designed their monitor systems with UREIs in the front and Boston Acoustics A150s or A100s for the surrounds. The acoustic designers felt the combination of tight imaging and accuracy from UREIs in the front and broad dispersion from the BAs in the back gave a good basis for 5.1 monitoring. Right about that time, my entirely unrealistic dream of a future home theater system began to coalesce around this design. I figured I'd go with the smaller UREI 811c’s in the front, because the 813s were just too large for living room consumption. 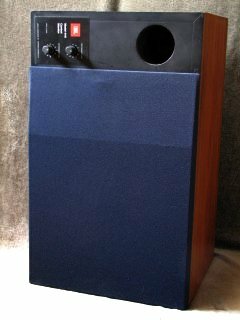 So in 1986, in wistful preparation for the day when it might happen, I saved up and purchased a pair of oak veneer Boston Acoustics A150s (10" woofer, 3.5" mid, dome tweeter) that began life as my front pair. I powered them with a Denon stereo integrated amplifier. For a decade and a half, I’d spend my days working on the UREIs and my nights going back home to my Boston Acoustics speakers. 1) The resultant satellite speakers were smaller, allowing them to integrate into home decor better, thus catering to the "housewife acceptance factor." 2) Since the subwoofer is self-powered, the resultant satellite speakers could be much more efficient, allowing designers to build five smaller amplifiers into one chassis. At our local facility, I was there in 1990 for the installation of the brand-new 811c’s and a Neve 51 series console and there again in 2003 at the next renovation, when the console was replaced by a digital Neve Libra series and the UREIs were replaced by a set of Genlec 1032a self-powered near-fields (pictured left - click to see one of the control rooms using Genlecs). Still in excellent shape, really just nicely broken-in, the UREIs went quietly into storage. Also that year, my home took a rather massive lightning strike to the wall containing our home theater gear, right as we were watching a movie! Besides fusing some power circuits and blowing the cable TV box three feet off the outside wall of the house, the strike toasted virtually every single piece of consumer electronics in the house, right down to the microwave oven. Of my stereo and home theater gear, only the Boston Acoustics speakers and a CD player survived. At replacement time, the insurance company replaced my Denon amplifier with a comparable-quality Denon receiver that offered 5.1 surround and subwoofer support. When offered the ability to use a subwoofer, I jumped at the chance. A self-powered Sony SA-WM500 12” soon joined the gang. By this time, however, my UREI dream system had pretty much slipped from my mind. This brings us up to 2006, my twenty-fifth anniversary as a full-time engineer, and to the fate of the UREI 811c’s languishing in storage. Eventually, the owners of our facility found themselves desperately short of storage space and needing to get rid of some large, stored equipment. That was my cue. 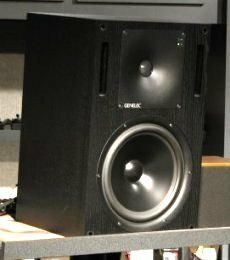 On hearing that the 811c’s might be for sale, and forgetting how large they are, I thought, “An engineer should always keep a spare set of monitors around home.” That sounds wise, no? After discussing with my wife the opportunity at hand, I made a ridiculously low offer for the pair, less than a cheap set of bookshelf speakers, less than the UREI grilles had originally cost, truly a token gesture. A few months later the need for storage space had become so acute that my ridiculous offer was actually accepted. Feeling like a thief, I got some help from a friend with a truck (isn't that typical?) and lugged the 110-pound monsters home. Just for fun, I set them up temporarily on footstools in the living room and connected them up as the front speakers in my living room for a celebratory listen. KABAM!!! Instant, clear stereo imaging. A solid, locked center image. Smooth, crisp highs. The UREIs even integrated well with the existing subwoofer. Hearing them for the first time, my son said, "WOW! THESE SPEAKERS ARE DIESEL!" Lovely. Just lovely. I think I’m in love. And then, I remembered my dream . . . But they were H-U-G-E, painted what UREI called “Utility Flat Black”, and they were undeniably ugly to behold, to anyone except an enthusiast like myself. In a living room setting, their blue horns and bright rims simply screamed “BACHELOR PAD!! !” And then my wife came home. After her initial shock, (“OH MY GOSH!! !”) and upon learning that my dream stereo had finally been realized, my lovely, infintely tolerant wife threw herself into civilizing them for living room use. We went out shopping and found embroidered tapestry cloth that harmonized with our living room colors to drape over the hopeless cabinets. We located an oatmeal-colored grille cloth that matched the grilles of the Boston speakers and I designed new grille frames. Of course, the speakers would need stands. As is my usual practice, I began researching my new acquisitions to find out everything I could. In the process, I came across an excellent article by acoustic consultant Bob Hodas on room tuning and integration of subwoofers, in which he mentioned UREI monitors specifically. 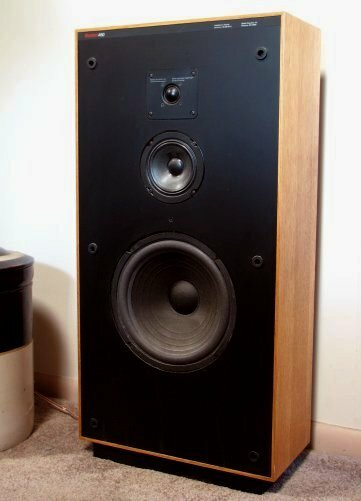 These speakers were originally designed to be soffit-mounted and suffered a loss of bass when operated free-standing. 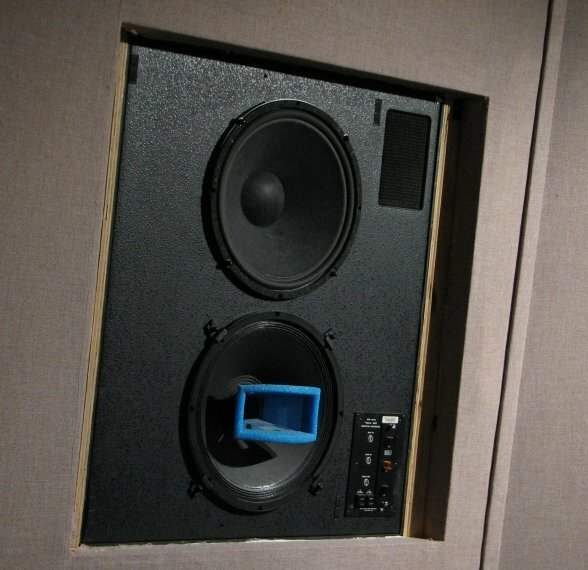 However, control room design was moving away from soffit mounting of speakers, so Bob had begun adding subwoofers to free-standing UREIs to take care of deficiencies in the bass. He had also discovered something I had begun to intuitively feel as well: that bass frequencies weren’t nearly as non-directional as we had all believed for years. In my experience I had discovered that I could sense the location of the subwoofer when I offset it to one side of center. To handle this, Bob suggested stereo sub-woofers. Meanwhile, with the huge, ugly UREI monitors in the living room, my wife felt that we needed to find a way to cut down on the clutter along the front wall. While researching and musing on stand options, an elegant solution presented itself to me: Why not use subwoofers as speaker stands? The single unit I had purchased two years before could provide a pretty good, low-profile stand for an 811c. 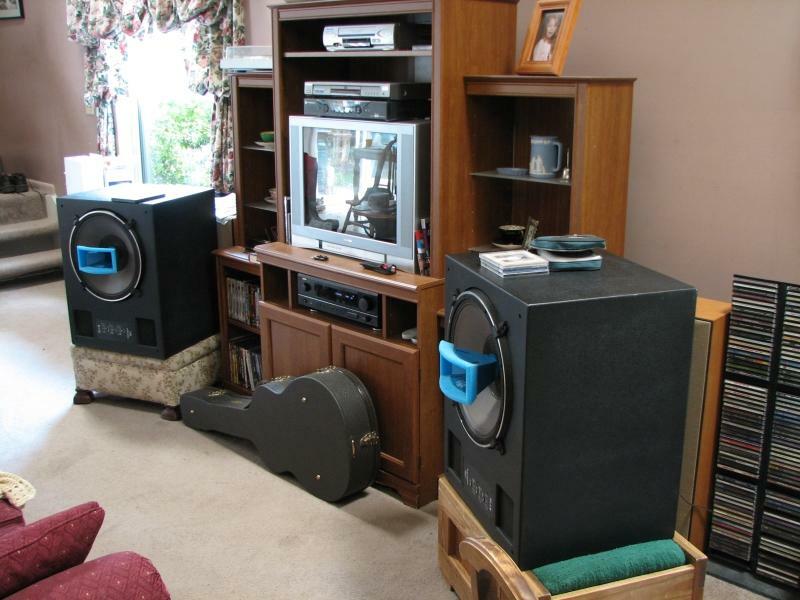 Moving it under a speaker would reduce the wall frontage required by the stereo by about 24” and lift the speaker by 14”, placing the tweeters at ear level for a person seated on the couch. 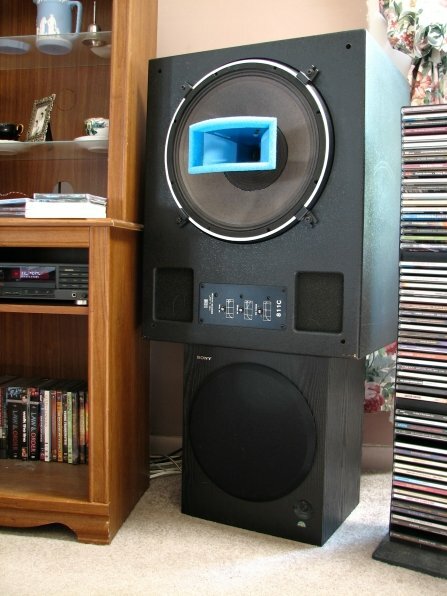 Acquiring a second subwoofer as the left-hand speaker stand would provide bilateral symmetry to the array. Surprisingly, that subwoofer model was still available two years after I purchased the first. Voile’! My wife stitched together a set of felt pads to go between subwoofers and UREIs to protect the finishes. With them in place, the stacks were comfortably assembled. But what should I do for a center speaker? I wanted something with wide dispersion to offset the focused sound of the UREIs, but I thought I should look for a speaker with a sound that complimented the UREIs' large-scale JBL components. 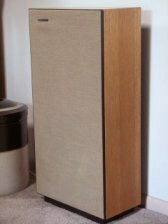 I was fortunate to come across a pair of neglected but mechanically sound JBL 4411 monitors (12” woofer, 5” midrange, and dome tweeter) that were also badly in need of a new home. After a little wrangling, I was able to secure the pair at fire-sale prices as well. With their walnut veneer dried out to the color of light oak after years of neglect, they sure didn’t look like much. Because they had been hung from Omni-Mounts, there were bolt holes in their backs that needed to be filled. But something twanged inside of me when I got these great old workhorses home, and I decided to pour in the work and undertake a restoration project. I whittled and sanded dowel stock to custom-fit pegs for each hole, tapped them into place and secured them with a little wood glue. I vacuumed the grille cloths and discovered, to my surprise, that they were in mint condition. I touched-up finish nicks here and there, cut-in the edges of the black fascia paint, and spent a few days rubbing oil into their thirsty finishes. From the ugly ducklings I discovered in storage, a pair of very pretty walnut cabinets emerged. With a little tweaking of their crossovers, I was able to get them into the acoustic ballpark of the UREIs. One of them took its place as the center speaker in our equipment console, below the video monitor. Next, I spent a little time with the manuals and my ears, roughing in the surround setup. That's an interesting enough prospect, when you consider that the UREIs are much more efficient than a typical monitor, nine db to be exact. Even though I was aware of that fact, the settings raised my eyebrows a wee bit. I followed the rough-in with a little quality time with a sound pressure level meter and test CDs and DVDs, working out the various balance and subwoofer/LFE settings on the surround amp to maximize everything and make hopping from one monitoring mode to another as seamless as possible. In the end, I’ve been very fortunate to end up with my dream audio system, though it took twenty-five years for it to come together! The system does stereo marvelously, supplying to the entire sofa area clarity and imaging detail that are second to none, as well as allowing occasional analytical work. Yes, I take home my work sometimes. 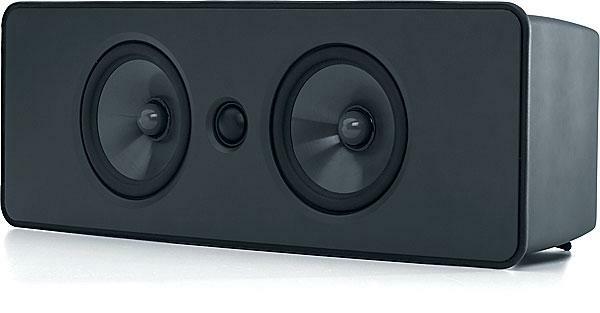 The system can also supply a reasonable five-speaker-plus-subwoofers wash for those times such as parties when I want to fill the room, rather than focus on the sofa space. For the home theater, the system downshifts into 5.1 surround at the push of a button, automatically detecting and supporting DTS, Dolby Digital 5.1, and Dolby Pro Logic I & II. The full-range Boston Acoustics A150s do indeed provide a very nice diffuse surround field as well as allow steered special effects to be followed easily. And how does it sound? Lovely, just Lovely! The result is a home theater system that out-performs any theater system I’ve experience except the very high-end THX-certified systems. The beauty of the situation is that my family doesn't have to brave the roar of the greasepaint and the smell of the crowd (and their cell phones) to enjoy a movie with high-quality sound. So, sometimes our little dreams can sneak up on us, and ultimately, can come true. In this case, one of mine finally did! Update: 08/10/08 We've recently upgraded to HD, and in doing so, wanted to streamline the center stack and reduce the frontage occupied by the JBL 4411 center speaker. In order to use less space, I replaced it with a Boston Acoustics HS225 speaker that features two 5.25" woofers and a 1" Kortec dome tweeter. The pair of 4411s moved to the music room. We also snaked flat fourteen gauge speaker cables underneath the carpet to feed the surround speakers. Wow, that was a job! Don't ever let anyone tell you that pushing a snake or fish tape in a straight line under a carpet isn't a chore. By the way, if my little stereo dream seems a bit over the top to you, click HERE to see a real "next level" dream system.